Last week, on Mexican Independence day, I decided to lunch at Richard Sandoval’s newest Mexican restaurant, La Sandia, at the Santa Monica Place. A friend met me at the impressively renovated, open-air, modern shopping mall. The third floor now has an exciting, chef-driven rooftop dining-deck. Here, noted executive chefs from around the world have opened some wonderful international restaurants. In the mood for Japanese, Mexican, Chinese, Brazilian, or Italian cuisine? You can find it here while enjoying the ocean or Third Street Promenade views. 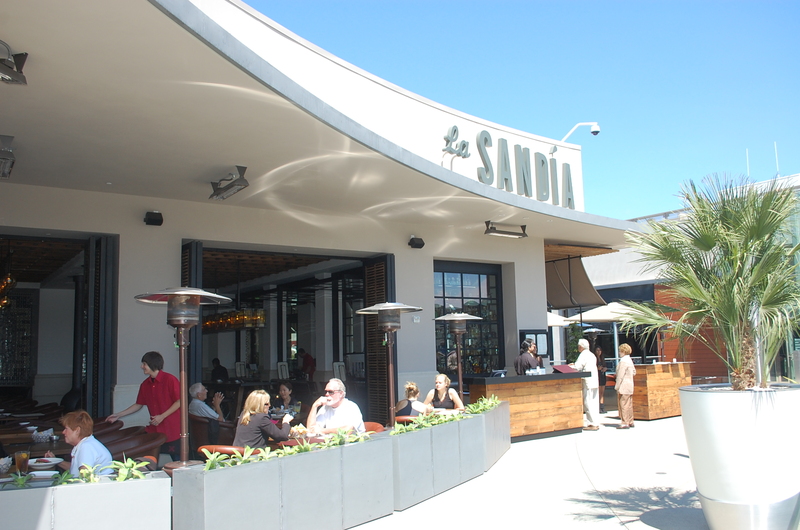 Richard Sandoval’s La Sandia is known for its trendy, upscale Mexican cuisine. Instead of yellow rice, refried beans and cheese-laden dishes, Sandoval replaces these items with Huitlacoche (Mexican corn truffle), pomegranate, and queso blanco. Born in Mexico City, he worked in his father’s restaurant from the age of twelve and later trained at Culinary Institute of America. Sandoval opened his first restaurant Maya, in New York City in 1977and became an overnight sensation. Since then, he now has fifteen restaurants throughout the United States and one at the Four Seasons resort in Punta Mita. We began our lunch with a Mezcal con Pepino margarita. The flavors of the Scorpion mezcal, cucumber, Serrano, lime and chile pequin salt imbued a zip that traditional margaritas lack. The bar holds 250 different tequilas and mezcals. Next time, I might try the Hibiscus margarita, or fresh sangria. Monday-Friday from 4 to 7pm, La Sandia offers a Happy Hour with Sangria, Passion Fruit Mojitos and House Margaritas for $5, Mexican beers are $3 and small plates are $3 to $5. 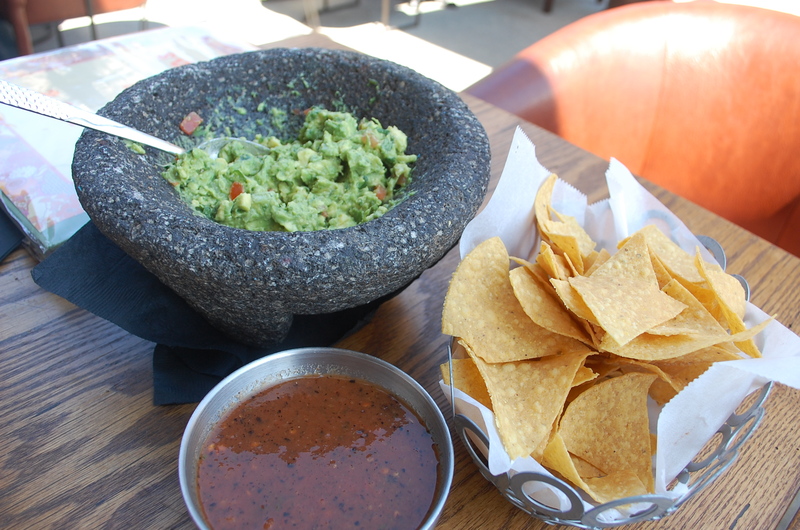 While looking at the menu, we ordered the guacamole prepared tableside in a volcanic lava molcajete (motar and pestle). Our waiter explained that a volcanic molcajete releases juices from the avocado, tomatoes, onions, and cilantro that enhance the flavors of the guacamole. It was fresh tasting and chunky. The salsa is freshly made with pureed fire-roasted tomatoes, garlic, onion and cilantro and offers a rustic flavor. Both are great dips with the warm tortilla chips. Being in the salad mood, I ordered the Ancho seared Ahi salad. Our waiter explained that the tomatoes in the salad are infused with sake and anise. When it arrived I pierced a tomato and enjoyed the zest of the sake combine with black licorice. The fresh Ahi was quickly seared and served on top of a bed of mixed greens, oranges, avocados and pumpkin seeds to enhance the flavors. It tasted different from a typical Mexican restaurant salad. Sandoval’s creative vision enhances his tacos, enchiladas and chile rellenos. I ordered the chicken mole poblano, since mole is served throughout Mexico for major celebrations. Sandoval takes a pan-roasted chicken breast and tops it with a thick, chocolate-tinged sauce. It’s served with rice, refried black beans, delicious fried plantains and sesame seeds. For our last course, we ordered the dessert tasting sampler featuring a small banana empanada with sweet cream, cinnamon sugar, vanilla ice cream and a cajeta (sweetened caramelized milk) sauce. Next to it was a mini caramel flan with pineapple-strawberry pico (salsa). My favorite was El Tres Leches, a delicate chiffon cake with three milks and walnut brittle. May Bueno. The interior of the restaurant reminds me of an elegant hacienda home in Santa Barbara. Sandoval spent time in Mexico ordering the beautiful tiles for the walls, ceilings and fountains. During the day and warm evenings, the restaurant’s giant glass sunroof ceiling slides back to allow fresh air and star gazing. Next door to La Sandia is Sandoval’s Latin-Asian fusion restaurant, Zengo. I’m eager to try it on another dining adventure. Sandoval’s creative menu and meals are worth a repeat visit. via La Sandia: Upscale Mexican Cuisine.